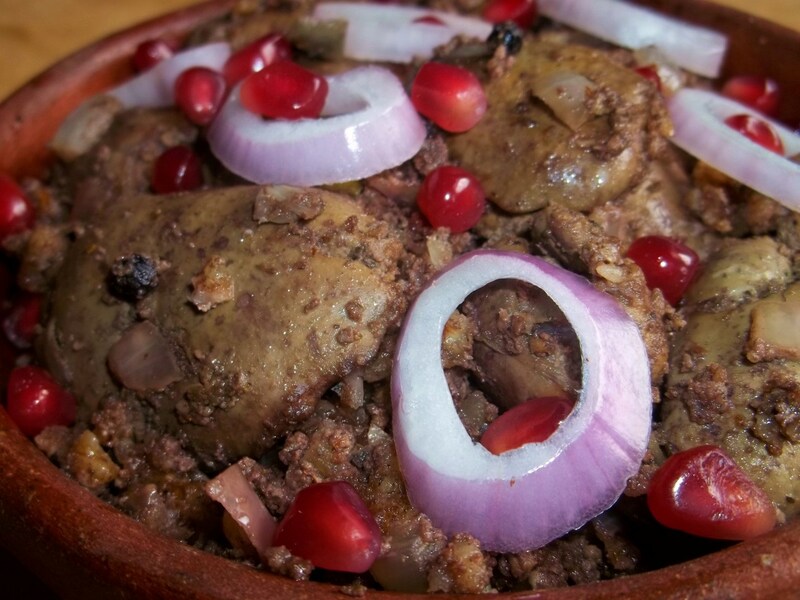 In this family recipe we show how to make a chicken liver dish with walnuts and spices. Quick and easy to prepare, it makes a delicious meal. 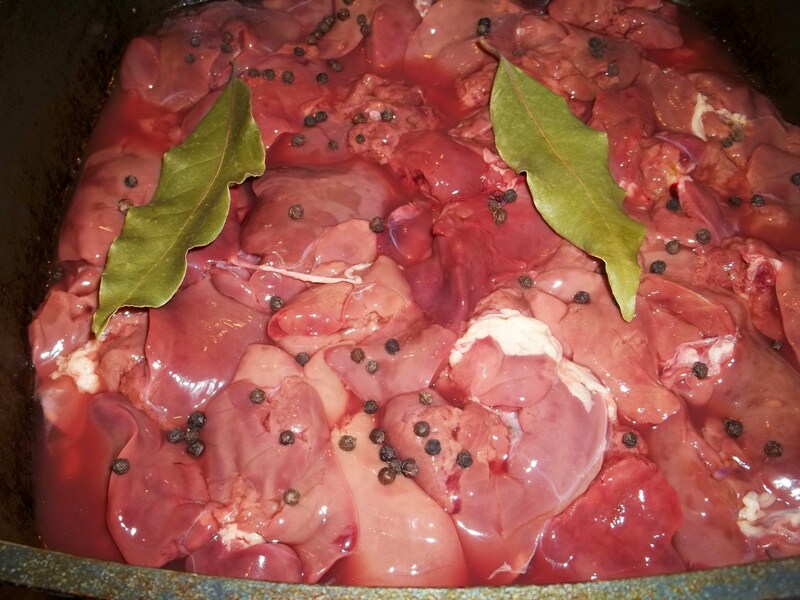 Ingredients: 1 kilo of chicken livers, 2 bay leaves, 1 tsp of black pepper corns, 200 grams of walnuts, 5 tbs of white wine vinegar, 400 ml of water, 70 grams of butter, 3 tbs of oil, 1 large red onion, 2 cloves of garlic, 1 level tsp of Summer Savory, 1 level tsp of dried coriander, half a tsp of blue fenugreek, half a pomegranate (seeds for garnish), and salt (amount dependent upon personal preference). 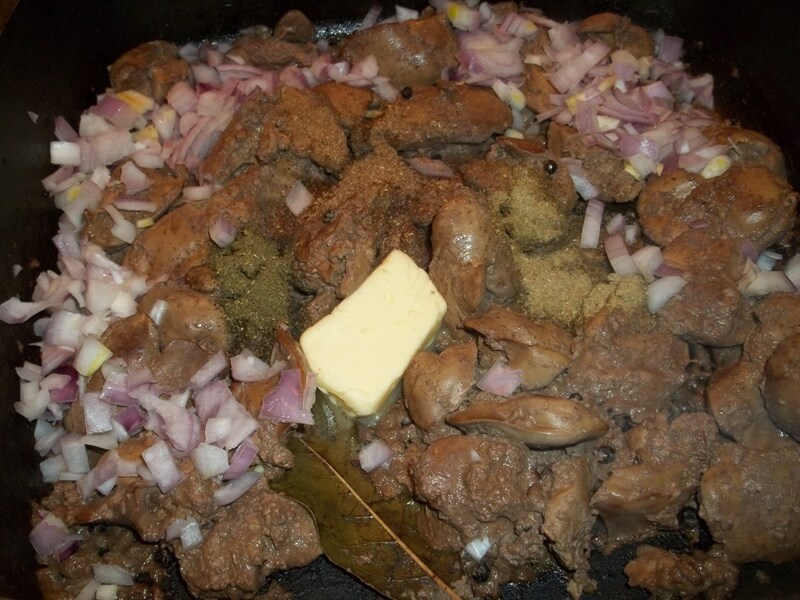 Preparation: Add the chicken livers to a pan. Add 400 ml of water, 5 tbs of white wine vinegar, 3 tbs of oil, together with 2 bay leaves and 1 tsp of black pepper corns. Cover and heat on a medium to high temperature for 15-17 minutes until all liquid has evaporated. 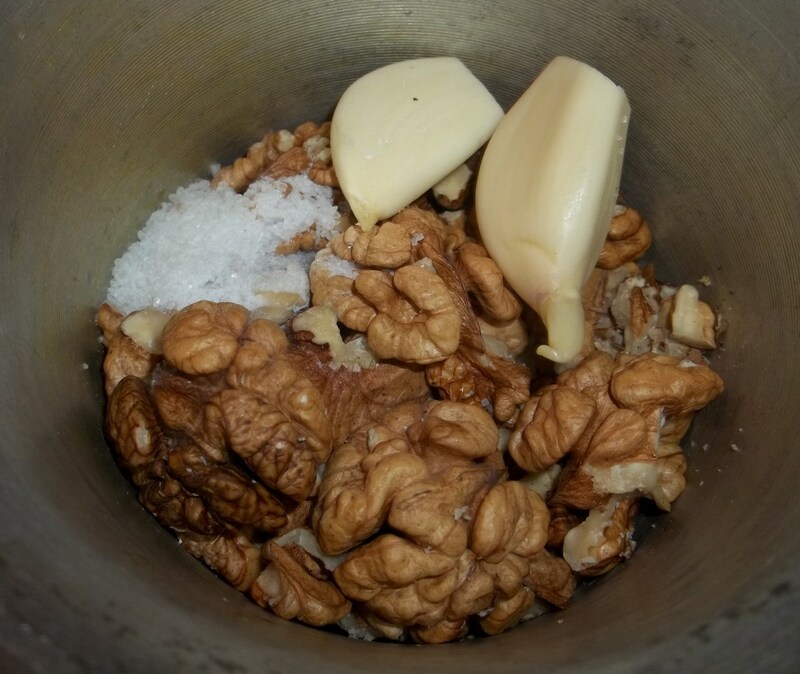 Grind the walnuts, garlic cloves and salt together. Chop the red onion and add to the pan, together with 1 level tsp of Summer Savory, 1 level tsp of dried coriander, half a tsp of blue fenugreek and 70 grams of butter. Stir. Reduce heat to low and continue to cook (uncovered) for a further 3 minutes. Add the walnut/garlic/salt mixture. Stir and turn off the heat. Serving: Serve hot. 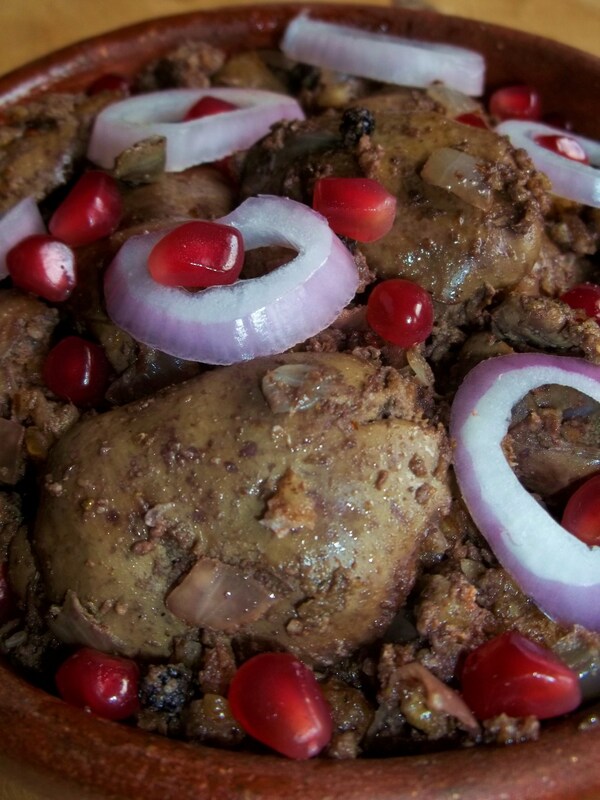 We garnished ours with red onion and pomegranate seeds. 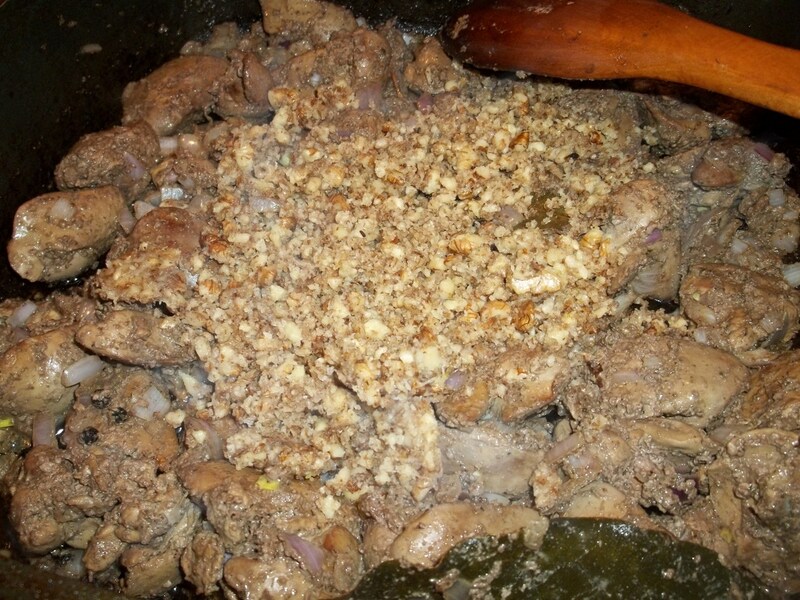 Enjoy your Chicken Liver with Walnuts!